Fashion is having a huge love-in with history right now. No corner of the past has been left uncovered, with inspiration coming from the (amongst others) Tudors, Elizabethans and Victorians mixed in with a healthy dose of 80s and a dash of 70s, whether it's a Laura Ashley style folk dress or a disco lamé blouse. The future is not forgotten either, with an abundance of metallics, foil finishes, iridescents and holographic everything. The designers really hitting my sweet-spot are Molly Goddard (her ethereal tulle creations are genius), Sadie Williams (she specialises in lurex metallics and collaborated with And Other Stories on a range I missed out on and now I have a permanent eBay alert just in case something of hers appears. OB. SSESSED.) and Gucci. The Italian power-house are on FIRE this season with a collection filled with over-the-top ruffles, frills, gold and embellishment. Is this not the most perfect dress EVER???? So, what's next? I'm going to take out my fashion crystal ball and peer into its murky depths to see what's lurking inside. These things may or may not see the light of day in the coming weeks and months, but if they do... you read it here first! The frilly neck-warmer is a natural progression from the current love-affair with historic dress but I've yet to find any on the high street. Etsy have some great ones, however. I'd wear a ruff with a plain t-shirt as added drama, or team it with a square-neck in a modern take on Elizabethan style and I'd recommend keeping the neck free of shirt collars etc so the ruff can do all the work. I hope the ruff catches on as it's super-flattering; framing the face like a fluffy cloud. The pinafore has been a fashion staple for years now (in my wardrobe I can spot denim, corduroy, cotton, silver lamé, leather - bought second hand I must add - and pvc at first glance), but I see a move towards a more folky frilly style,to be worn over a shirt. I have seen the above dress in John Lewis and I would wear it EVERY DAY if I could but it's in the childrens' range and not even big kids' (I can wear age 12 clothes as I'm a shortarse)... it only goes up to AGE 7. AGGGGHHHHHHH! Come on people! Come ON John Lewis! Make this dress for grown-up ladies please!!!! I trawl eBay every day in their vintage section looking for a real Little House On The Prairie pinafore but so far, no joy. Again, another natural progression from the obsession with history, in particular the Tudor period, where women of wealth wore beautiful crown-like jewelled hair bands. Dolce and Gabanna have this stunner but if its £670 too expensive for you, Miss Selfridge have this in the sale. If the Miss S headband sells out, as it will, there are some great ones on Etsy once again. 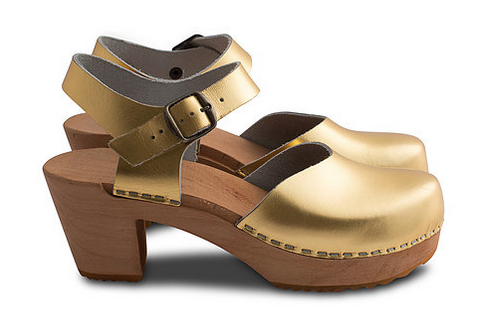 Yes, clogs. Not the clunky croc type, think more sassy and feminine. The Swedish Hasbeen has been (see what I did there?) on the radar for a number of years and they don't seem to be going anywhere soon. However, I think this summer they will be HUGE (not huge clogs, that would be weird) and are the perfect accompaniament to the frilly pinny. I think the heeled, closed toe styles will be most popular and I have ordered the above pair in gold from Kitty Clogs Sweden. I'll be teaming them with bright red tights and my denim pinafore maxi-dress. Ok, that's it for this time, any thoughts or comments don't hesitate to get in touch.